Acclaimed pastry chef Michelle Karr-Ueoka grew up in a household with art-loving parents and also visited the Honolulu Museum of Art regularly on school trips. Which is how she fell in love with Monet’s Water Lilies, on view in the Impressionism Gallery. “It was one of my favorite paintings growing up. I remember always coming in and studying it,” she recalls. So it was only natural that she picked is as her inspiration for Palette, the museum’s new spring benefit being held April 6. Along with Karr-Ueoka, the event features chefs Lee Anne Wong of Koko Head Cafe, Kevin Lee of Pai Honolulu, Robert Paik of HoMA Café, and Wade Ueoka—Michelle’s husband and partner in MW Restaurant. They were invited to wander the museum or browse a selection of images of artworks and select one on which to base a trio of dishes—two small bites and one full plated course. Michelle selected Water Lilies for a second reason. She and Wade have a farmer-chef alliance with Tokachi Hills, the famed farm owned by Issho Kajiwara, who produces everything from beans to pigs—all served in the farm’s restaurant. 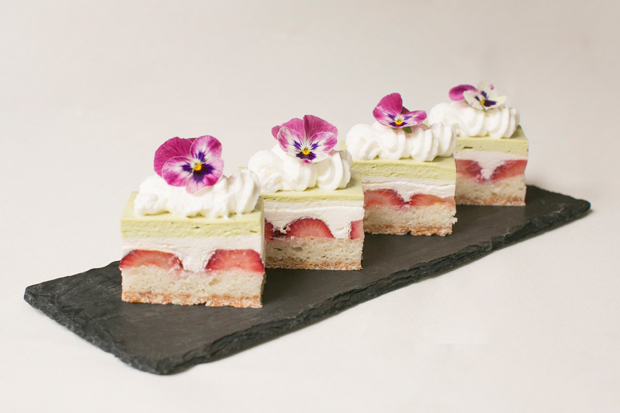 Michelle Karr-Ueoka’s memory-filled strawberry matcha shortcake. So her Platinum Table dessert, which she calls “From childhood to Tokachi, a journey of lifelong memories,” is as visually lyrical as Water Lilies, and brings together elements symbolizing her childhood (li-hing strawberries) and Tokachi Hills (kinako—roasted soy flour—from the farm). Her small bites desserts—like the strawberry matcha shortcake pictured here—do the same in an abbreviated fashion. 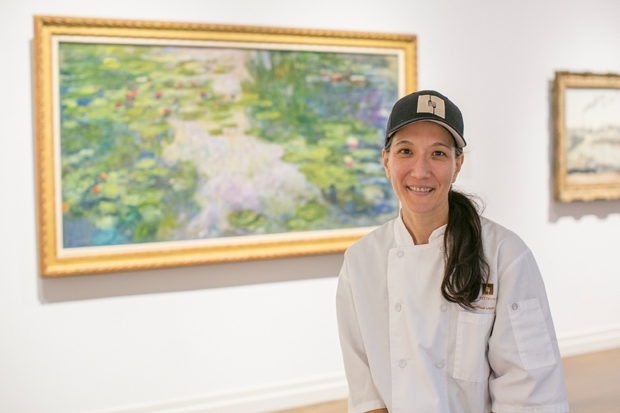 The only way you can get a taste of Michelle’s Monet-inspired desserts is to buy a Palette ticket or table. See the full menu and get your tickets online. Next week: See what Wade Ueoka picked as an artwork and the dishes it inspired.